Picture the scene, an ordinary Thursday morning in Seville. The streets are crowded with a line of muscle-bound oxen, pulling gypsy-style caravans, all striving to outdo each other with an array of billowing fabric and garish colors. Proud Andalusian stallions flick their tails excitedly as a pedestrian skims their hind quarters. 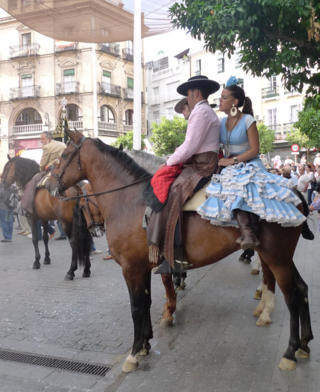 A dark-eyed young woman adeptly applies her lipstick, whilst sitting side-saddle on her steed, dressed immaculately in a polka-dot flamenco dress and matching flower in her hair. The beer is already flowing and the drums rolling, the excitement and expectation hang unmistakably in the air, as man, woman and beast wait impatiently to begin their week-long round trip, taking them through the wild, Andalusian terrain to the object of their devotion, the Virgin of Rocío.